HomePoint-BlankEDITORIAL: Is Ghana a Banana Republic? EDITORIAL: Is Ghana a Banana Republic? Just take a closer look at these pictures, taken in the 21st Century in the centre of Ghana’s capital, Accra. An area where a multi-million cedis worth of new Law Court buildings have been errected. 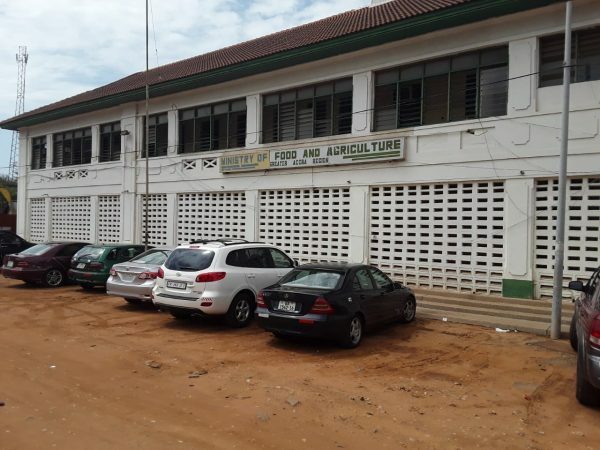 To add insult to injury, the offices of the Greater Accra Regional Ministry of Food and Agriculture is also nearby. This is even more serious; near a government institution that is supposed to manage the production and distribution of FOOD items to the people. These photos are also not far from the Kwame Nkrumah Memorial Centre and the Independence Square. The Ministry of Tourism will tell you these are two of Ghana’s tourist attractions. Are we spending millions of dollars on advert campaign strategies abroad for tourists to come into the country to see such places as depicted in the photos? Is that Ghana’s brand of attraction in tourism parlance? The interesting thing is that nobody seems to care.What sort of a country is Ghana at all? Always boasting as the first country South of the Sahara to gain its independence. Independence to litter our surroundings with rubbish and leave dangerously uncovered gaping holes? This is a country just on the threshold of the anniversary of the fire and flood disaster in Accra during which scores of people lost their lives. Is this the sort of memorial we wish to leave behind in their memory? 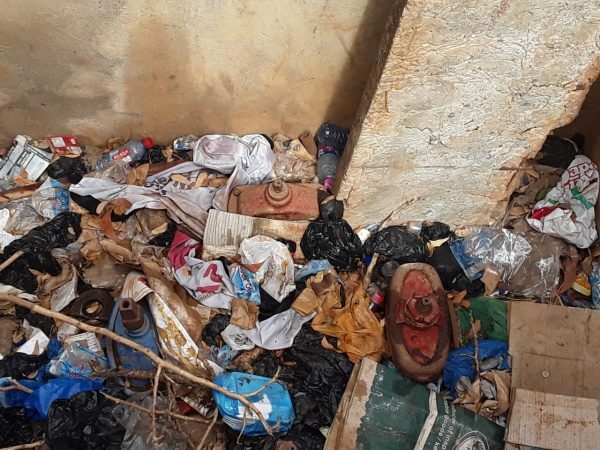 Since when has clearing of rubbish in the major towns and villages in Ghana become a political football to be tossed between the two major political parties who seem to be the masters of incompetence. Take a look at the pictures again. If this is not incompetence, kindly tell us what this is. 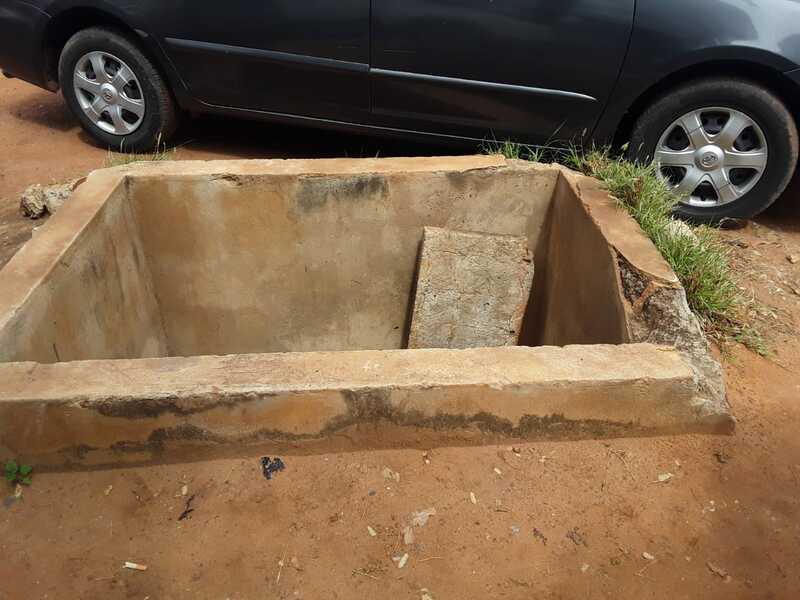 The big hole shown under, we understand belongs to the Ghana National Fire Service – that is, the venue of one of their possible sources of water in the event of a fire outbreak. A modern, civilized fire fighting institution, such as the Ghana National Fire Service, will undertake the control and regular inspection of its property. But no, as for Ghana and some of its institutions, anything goes. Who is the Minister of Interior? What is he or she doing? Is the Ghana National Fire Service not under this ministry? The Minister must ensure that this huge gaping hole is cleared of rubbish and covered as soon as possible. Are we waiting for disaster to happen before coming to shed crocodile tears? A small child could fall, (God forbid), into this unwarranted hole. That child is Ghana’s future. Or is it that we don’t care about the future of Ghana? A country that neglects its responsibilities towards its children has no future. It is time Ghanaians drop that obnoxious tile of HONOURABLE for its politicians and Members of Parliament. The title is like a MASK on their faces; it has blinded them to see the stark realities of the people they claim to be ruling and the surroundings in which they live. Let’s give the word HONOURABLE a break of one year, just one year; that is, twelve months. Let all Parliamentarians drop the title HONOURABLE for one year and hit the road to lift their people from squalor and abject poverty. 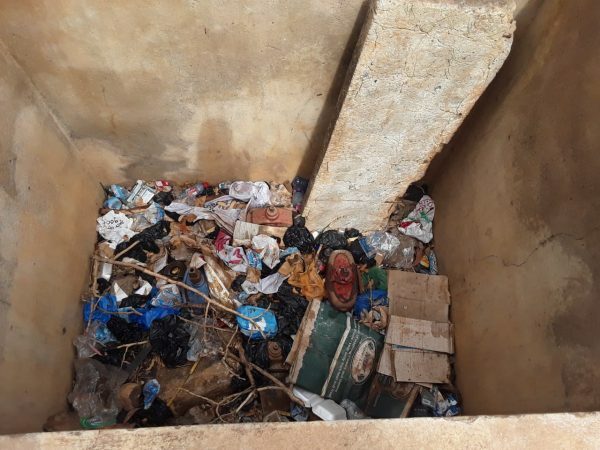 They should go into the gutters, or holes, such as the Ghana National Fire Servive hole just in the centre of Accra and clear them of rubbish. Just for One Year of roaming around MINUS the HONOURABLE title. When you call someone HONOURABLE, they think they are tin gods, unfit to hold the shovel. As a middle income country confronted by serious poverty and environmental degradation, we should have no business with such titles. The photos on this page, from the capital of Ghana is incompatible with the word HONOURABLE. They are the attributes, the handwork, and the result of DISHONOURABLE DEEDS.